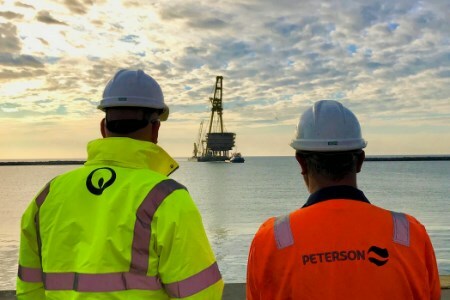 Veolia-Peterson joint venture – comprising Veolia ES UK Limited and Peterson UK Limited – has signed a contract with the offshore heavy lift and pipelay contractor Allseas for the provision of dismantlement and disposal services for a major Northern North Sea decommissioning project. The strategic partnership’s main scope is for the disposal of the steel platform’s integrated accommodation, drilling and production topsides, which will be removed and delivered by Allseas, as a single lift weighing around 12 600 t, with the option to add the jacket removal scope. The operations will commence at Veolia-Peterson’s managed Dales Voe site in Shetland in 2020, with preparation works at the site planned to start in 2019. The quay infrastructure was completed by Lerwick Port Authority in 2016 and was designed with Single Lift in mind, capable of accommodating the significant loads of up to 60 t/m2. Allseas were awarded the contract to Engineer, Prepare, Remove and Dispose (EPRD) and chose the collaborative Veolia-Peterson partnership to complete the platform’s onshore disposal. Veolia-Peterson are experts in their respective fields, Veolia specialising in waste disposal and Peterson providing an integrated logistics service, working seamlessly together to provide a complete decommissioning package. The partnership always aims for a minimum of 97%+ recycling rate, which is the target for ongoing and future projects.